The best of health and fitness products. 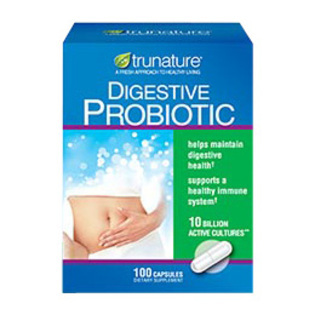 Reviews and Ratings on health products; probiotics, acidophilus, sinus-rinse, etc. Also featuring reviews on recumbent exercise bikes and heart rate monitor watches. It happens once in a great while that I buy a product which exceeds my expectations by so much that it feels like I stole it. This is one of those rare finds that proves what you pay for isn’t necessarily what you get. With the Stamina R360s, you get far more than you expected – and then some. Unlike traditional exercise bikes, recumbent bikes have a comfortable, adjustable reclining, full seat. My wife and I decided it would be useful to have an exercise bike for those days when the weather is too hot or too cold. Also, bikes are a great way to get aerobic exercise without putting stress on the knees, backs, hips, shins and other parts of the body that tend to give us problems as we get into our 30’s, 40’s and beyond. I’ve been a regular member of an exercise gym for the last several years, and have learned to know what I like in exercise equipment. I expected to pay $300 or more to get a low-end recumbent that would provide reasonable quality and features. From past experience, I prefer the comfortable seats of the recumbent bike over the traditional, upright bikes. For $300, I hoped the bike would come with some of the basic features that I use: Heart Rate monitoring, magnetic resistance and gauge for measuring speed, time and distance. I found exactly what I want, with one exception: The Stamina R360s does not cost $300 or more. It doesn’t cost $200 or more. It costs $108.67 at Walmart! You might ask, “Why would you pay $108.67 for a bike when your budget was for $300” The simple answer is that after reading numbers upon numbers of user reviews, all of them have a fair amount of negative feedback – even recumbent bikes costing $500 or more. So, recognizing that no bike under $500 is going to be perfect, why not save some money and buy the one that is the least expensive? The Stamina R360s had a large number of online opinions, and most of them were very favorable. Also, the Stamina R360s includes the most essential features required in a recumbent bike. So, what exactly do you get for $108.67? A darn good recumbent exercise bike, built on a solid, thick, metal frame with comfortable, gray-colored seat and back support. There are lower handles at the back, with pulse sensors and touch controls for increasing or decreasing the resistance. In the front of the bike is an LCD screen with large, easy-to-read black numbers which indicate, time, speed, distance, calories burned, and pulse rate. Exercise data will scan and revolve from one to the next, as you continue your work out. Or you can lock-into one particular set of data by pressing the mode button while that feature is displayed. For example, if I want to view my pulse for a fixed amount of time, I press the Mode button while my pulse is displayed, and it becomes permanent until I press the mode button a second time. The pulse is measured by the sensors which are comfortably located on the handle-bars in the rear. If that isn’t convenient enough, these rear handle bars also have thumb-push buttons on the ends of them for controlling the resistance of your workout. The Stamina R360s uses magnetic resistance which is a technology you’d expect to find only on more expensive bikes. The left thumb-button makes the bike easier to peddle and the right thumb-button makes it more difficult. The manual was clear and well done, and assembly was a breeze. I am by no means a mechanical person and it required no more than an hour to have it fully assembled. While you’re thinking this bike seems very well equipped for the price, you are probably wondering if the actual operation and performance live up to the hype. Yes, they do – at least in the short-run. For starters, the operation of the R360s is extremely quiet – quieter than many of the bikes I’ve used at the gym. Though it is no where near as heavy as a commercial-grade exercise bike, it feels solid and doesn’t move when I am riding it, even at a high speed. At 170lbs, I feel very confident and stable using it, and have no doubt that it would handle at least another 50lbs. The bike will accommodate a large range of different sized children and adults through an adjustable knob on the base. One very minor annoyance is that there is no provision for adjusting the seating distance while you are riding. In fact, making adjustments, even when you’re off of the bike, proved to be a slightly difficult task. This is not much of a problem for me, because my wife and I are both comfortable using the same seating adjustment. I could see how this might be a bit of a drawback for several different-sized family members who want to share the bike. The touch buttons for operating the magnetic resistance are very easy to use and work quite well. I am also completely satisfied with the range of resistance, which makes it very easy to peddle at the very lightest setting and more than difficult enough to really tax your legs at it’s very highest. The pulse reading is extremely accurate. To verify this, I worked out using my Timex, TG971 Heart Rate monitor to compare. The two readings were identical. Also, the LCD screen is very easy to operate and includes very large numbers which are viewable from anywhere the bike seating is adjusted. Also, the LCD display has a small pocket for holding your MP3 player. The cushions on the seat and back support are adequate, but a little bit thin. Not a problem, because you can always buffer it with a pillow or extra cushion of your own. When I say quiet, I mean whisper quiet. You really can watch television while working out, without even adjusting your volume beyond your normal listening level. The only possible drawback I can see with this a bike at this price is the fear of the unknown. That is, wondering whether or not it will hold up and last over time and extended use. I was paying $39.95 a month for my health gym membership. The R360s includes a 90 day parts warranty and 1 year for the frame. That should at least cover 3 months of gym membership fees. Personally, I cannot see much going wrong with the frame. My concern would be with the moving parts, the electronics and magnetic resistance. Meanwhile, I hope to be getting many good aerobic workouts with this machine. I will report back in three to six months on how good the $108.67 investment is holding up in value.Stamina bike models have changed since this review. Pros: Accurate pulse readings. Crisp display. Comfortable chest strap. The T5G971 is a Timex Heart Rate Monitor. The T5G971 looks like a regular sports watch, yet in addition to keeping time, serves as a full-featured Exercise Heart Rate Monitor. The T5G971, with the use of the included Chest-Strap, will accurately display a digital reading of your pulse while you workout, jog, run, walk, or simply type on your computer, as I am doing now. Unlike other heart rate monitor watches in the entry level price range, the T5G971 includes a chest strap with built-in sensors, meaning that you do not have to place your finger on a heart-rate sensor to get a reading of your pulse. Judging by the price, the T5G971 is obviously not the best heart rate monitor you can buy. One of the more popular ones is the Polar F4 Heart Rate Monitor which costs about $20 more, but has a few more bells and whistles. As a previous owner of one of the Timex finger-sensor models, I can tell you that the chest-strap is the only way to go. My previous watch was never of much use to me, as I had a difficult time getting it to recognize my pulse through the finger sensor. What’s worse, the movement during an actual workout made it impossible to use during an exercise session without stopping first to steady my finger on the sensor. Unless it has a chest strap, I have concluded it cannot be a worthwhile exercise heart rate monitor. While I was skeptical of trying another Timex Heart Rate Monitor watch, I received this from my daughter as a Father’s Day gift, and the chest-strap has made all the difference in the world. It really works, and works quite well! The T5G971 Timex Heart Watch feels sturdy and well-built. The wrist strap comes with several adjustment notches for fitting any-size wrist. The Chest Strap is a flexible rubber band with sensors underneath which fits comfortable underneath your sternum and fits into an adjustable-sized snap in front. There are five buttons for operating the watch: On the left hand side is a setup button for programming the watch, and a Recall button for displaying workout information. Along the right hand side, is an Indigo Light and Heart Rate Recovery button. The fifth button, on the bottom of the top bezel is for turning the pulse display On/Off, as well as toggling an audible timer. In addition to keeping your current pulse and time, the Timex T5G971 keeps track of and records your average heart rate, maximum heart rate, calories burned, and Target Heart Rate zones. Supplemental exercise instructions are included for helping you determine your heart rate zones. Your maximum and minimum heart rate zones are easily programmed into the watch, along with your weight for determining the number of calories you burned during a workout. By far, my favorite feature is the 1-Minute Heart Rate Recovery function, which through the press of a single button, will measure how many beats your heart rate slows down when you’ve stopped exercising. This is a great way to determine the level of your cardio fitness, without having to look at a watch or clock to determine when a minute has passed by since you stopped exercising. The built-in timer does it for you and records the number of beats per minute that your heart recovers after you’ve ceased exercising. Target heart rate zones are programmed by holding onto the Set Button, while the watch is tracking your pulse, and then choosing your minimum and maximum heart-rate zones, as well as your maximum pulse. You will also be able to enter your weight for tracking calories. The watch will begin recording information about your work-out, upon the moment it first begins to track your pulse. When you have finished your work out, you can press the recall button and continue tapping on it to scroll through your fitness data; Workout-Time, AVG Heart-Beat, Recovery Rate, Time in Rate Zone, Peak Heart Rate, and calories burned. It’s really that simple. 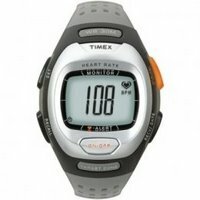 While more expensive watches such as the Polar F11 (selling for about $90 more) have the ability to record and upload data to and from a PC, the Timex T5G971 does a great job at doing what it’s intended to do – that is, keeping accurate track of your pulse and providing you with the most vital cardio workout data. I found the watch fairly tricky to setup for the first time, but this is pretty much true of all watches which use a limited number of buttons for programming them. Also, I’ve had some trouble from time to time, getting a pulse reading when the Chest Strap is first installed. Once the pulse is detected, it never fails to continue working even under very vigorous exercise and movement. I’ve tested the watches accuracy by timing my pulse with a 2nd-hand and comparing. The results are identical, so I am confident that the Timex is always giving me data which is 100% accurate. For it’s low-price, accuracy and essential features, I highly recommend this watch to anyone who doesn’t need or care about interaction with their computer. Check back soon for more reviews as new products become available. What are Probiotics / Acidophilus Used for? Why take Probiotics / Acidophilus? What is the Best Probiotic formula? What is Acidophilus or Probiotics? Years ago, I discovered a great little secret for keeping your stomach feeling healthy and happy: Probiotics, otherwise known as acidophilus, are known as the ‘good or friendly’ bacteria that aid the immune and digestive system. Unlike antibiotics, which kill bacteria in your body, Probiotics actually colonize your body with these friendly or good bacteria, such as Lactobacillus or Bifidus-Regularis. One reason is that you’ve recently taken antibiotics for an infection. Antibiotics, which kill infectious bacteria, can also deplete the body of the bacteria that’s good for your immune system. If you’ve ever had an upset stomach while taking antibiotics, this is probably what caused it. While Yogurt has been a long-time, natural way of filling your stomach with millions of these beneficial bacteria, probiotics offer a much more powerful way. The top brands on the market claim to provide, not millions, but billions of the helpful and effective bacterial agents found in Yogurt. I can claim, first-hand that they really work, but not all brands are created equal. I tried several before discovering one that seems to trump all the others. What is the Best Probiotics Formula? About 4 years ago, a Sales Rep at the vitamin cottage recommended Reuteri, by Nature’s Way. You can find it in the refrigerated section of supplements at any good vitamin and health store. For treating most common stomach ailments; IBS, Diarrhea, Constipation, bloating, gas, etc., Reuteri is remarkable. Back when I first tried Reuteri, I was going through a particularly rough time with my digestive system. After several months of this, I actually visited my doctor and had some blood tests done. Though nothing was found, my doctor referred me to a Gastroenterologist for further testing. About a week before my appointment, I was visiting my local Vitamin Cottage, when the thought struck me that I should try Probiotics or acidophilus again to see if it helps. But there are so many brands. Which one would be best? I happened to ask an extremely knowledgeable sales rep, who led me to a refrigerated section of the store, and picked up a bottle of the Reuteri, and said, “This stuff is really amazing”. He recommended starting out with 1 capsule a day, and increasing it to two and even three, after a period of a week. Upon checking out at the cash register, the woman who rang me up, gave her very own endorsement of the product as well. I started taking the Reuteri about a week before my GI appointment. Believe it or not, by the time the appointment I visited the doctor, my symptoms were 90% gone – and this was after several months of problems. The doctor diagnosed me with IBS, and said to keep up with the Probiotics. I replied, ‘not just any Probiotics – Reuteri’! That was four years ago, and since, then I have never had any long-term problems. When I feel my system acting up, I simply increase my dosage by a pill or two, and it works! Whether you are suffering from IBS, problems with diarrhea, constipation, bloating or even nauseousness, I guarantee that Reuteri will help you. I should also mention that the price of this product has nearly doubled since I purchased my first bottle. That is testimony to the fact it really works! I have recommended this product to many other friends, co-workers, customers, family members, etc., and have yet to find someone who told me it didn’t help them. Give Reuteri a try – you won’t regret it.